There is no magic wand that can make you a better speaker. In US, more than 70% of all people, cutting across age, gender, professional and academic qualification, have a fear of public speaking. Speaking at an event is not a daunting challenge but most people lack the confidence. They are of the opinion that they do not possess the skills that are needed to become a good speaker. The reason why most people lack confidence is because they do not practice and do not have much experience with public speaking. 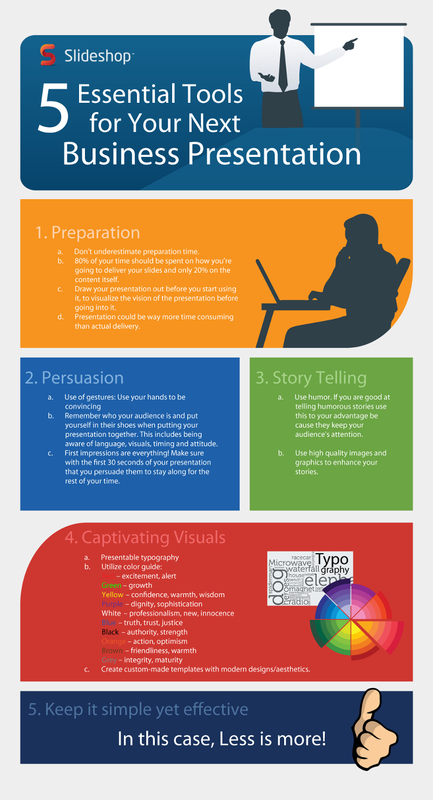 The best practices to follow for making a great business presentation and garner the most response. Great public speakers are not born. They are groomed over time. Practice makes them perfect. But there is another aspect to it as well. To be a good speaker, you need knowledge. You must be confident about what you know. You need to be an expert of sorts on the topic that you are talking on or presenting. Without knowledge, you would never have the desired confidence to deliver a great speech. Steve Jobs was a great speaker but it was in domains that he was an expert in. Can Richard Branson deliver a speech on orthodontistry as confidently as he speaks on investments and business climates? You know the answer to that. In this slideshow, you would discover the tips and tricks to become a better speaker. These tips are more of a guide. The slideshow is actually a handbook using which you can hone your public speaking skills. There are many advices in the info-graphic. You cannot possibly adhere to all those right away. But you can always start. You have to start practising and how you should do that is discussed in great detail in the presentation. To become a better speaker, you need to be dedicated, you must be devoted to your speaking attributes, you must practice and expand your knowledge. The more aware you are, the more you know and the better you can communicate your ideas to others in a simple way, the more effective and impressive a speaker you shall become. It doesn’t take much time to become a good public speaker. You must endorse the best practices, follow the tips that are in the associated slideshow and focus on doing away with all the shortcomings that you may have. While you aspire to become a better speaker, you would face challenges and shall come across many problems. The slideshow also gives you ways out in such instances.